For many years, Mercedes-Benz stuck with a primarily numerical naming system for its model lineup, with descriptive letters trailing. Then it switched over to primarily letters followed by numbers. The company recently overhauled its naming convention yet again in an effort to clean up certain inconsistencies with the letter system. So now the automaker tackles the luxury market with a core lineup composed of five letters, the most important of which are S, E, and C (in descending order). And the roadsters? Both models borrow nomenclature from the S-, or “Sonder” (Special), Class, the flagship of Mercedes’ range. The smaller of the two, the SLK, was replaced with the SLC for 2017 (no place for a “K” anymore). But at the top still sits the SL, termed the “Super/Special Light,” a unique combination of comfort and performance for discerning luxury roadster fans. Last redesigned for 2012, the 2017 SL-Class represents a mid-generation refresh. To begin with, check out the front fascia: you’ll see sharper, flatter headlights, which Mercedes calls the “standard-fit LED headlight system,” something of an attempt to mimic the raked headlight setup currently in vogue among premium or sportier cars. The lower air intakes have also grown quite a bit. Even with the narrower headlights, looking head-on at the front of the car gives one the impression that everything has basically grown larger. The grille has also been given a cleaner appearance—Mercedes claims it drew inspiration from the 300SL Panamericana, an older coupe model best known for its signature gull-wing doors. Although largely unchanged, the SL’s engine choices are solid all around, if somewhat less performance-oriented at the bottom end. Choosing between them basically means considering what type of driving you plan to do most. The SL450 is a comfy sports car, better as a grand tourer. The SL550 adds enough power to make it a dynamic driver as well as a premium luxury vehicle. And the AMG SL63 and 65 are the true performance trims—you’ll likely already know if one of these is the vehicle for you. The base SL trim actually used to be the SL400. Now it’s the SL450, with a twin-turbocharged V6 putting out 362 hp and 369 lb-ft of torque, good for a 0-60 mph time of 4.9 seconds. Note that moving from one trim to another for the SL means a pretty significant difference in both price and engine output. The SL550 carries a 4.7-liter twin-turbo V8 cranking out 449 hp and 516 lb-ft of torque, which drops its 0-60 time to 4.3 seconds. Then come the AMG trims: the SL63 uses a 5.5-liter twin-turbo V8 with 577 hp and 664 lb-ft of torque, the SL65 a giant 6.0-liter twin-turbo V12 with an awesome 621 hp and 738 lb-ft of torque. And yet both AMGs do 0-60 in almost the same time, 4.0 seconds for the SL63 and 3.9 for the SL65. The SL450 and SL550 both employ a new 9G-Tronic (i.e. 9-speed) automatic transmission, and the AMG SL63 and SL65 use slightly different versions of Mercedes’ Speedshift 7-speed sports automatic. The EPA has not yet released fuel-economy numbers for the 2017 SL-Class, but you can probably expect them to be about the same as what we saw from the 2016s: 20 mpg city/27 highway/23 combined for the SL400, 16/24/19 for the SL550, 16/25/19 for the AMG SL63, and a predictably unimpressive 14/21/17 for the V12 AMG SL65. All trims require premium fuel. It's to the credit of the SL-Class that its 2017 iteration a) loses some weight, to the tune of 220 pounds, thanks to a new aluminum bodyshell, and b) sports improved handling technology. The Dynamic Select system offers 5 drive modes: Eco, Comfort, Sport, Sport+ (think flat and fast), and Individual (lets the driver manually adjust driving parameters). An Active Body Control function reduces body roll, the vehicle will automatically lower itself for better aerodynamics at high speeds, and a button in the cockpit allows you to raise the body in order to better negotiate rough or rutted roads. Mercedes outfits its new SL models with an electrohydraulic vario-roof that can open or close at speeds of up to 25 mph; a new automatic trunk separator adjusts trunk space according to whether the top is up or down. The “vario” in the roof name refers to the “Magic Sky Control” system, which is able to lighten or darken the panoramic roof in response to outside brightness in a matter of seconds. The interior of the SL-Class is as luxurious as its price tag suggests. There is a broad range of trim materials, and an ambient lighting feature is available in three colors: solar red, polar blue, and polar white. The two-tube gauge setup and analog clock on the dash offer a classy contrast to the TFT multifunction driver’s display and larger infotainment screen. A Harman Kardon Logic 7 Surround Sound system comes standard, with a 600-watt output and 11 speakers. Available as an option is a 900-watt, 12-speaker Bang & Olufsen BeoSound AMG sound system. A standard “Frontbass” system uses cavities in front of the footwells to produce a more resonant bass, and an optional smartphone integration package offers Apple CarPlay capability. The SL-Class is too much a premium car to be crash-tested by either the National Highway Traffic Safety Administration or the Insurance Institute for Highway Safety. There is, however, an optional driver assistance package that provides the usual array of high-tech safety features, like a Mercedes-specific cruise-control system with steering assist, an active brake assist, forward autonomous braking, blind-spot and lane-keeping assist, and a rear-end collision mitigation system. Standard LED headlights automatically adapt to external factors like reduced visibility and cornering. Expect pricing on the 2017 SL-Class to remain about the same as it was for the 2016 model. Again, there is a big spread between trims: the SL450 should start around $85,000, the SL550 around $109,000, the AMG SL63 around $150,000, and the AMG SL65 somewhere close to a breath-catching $218,000. 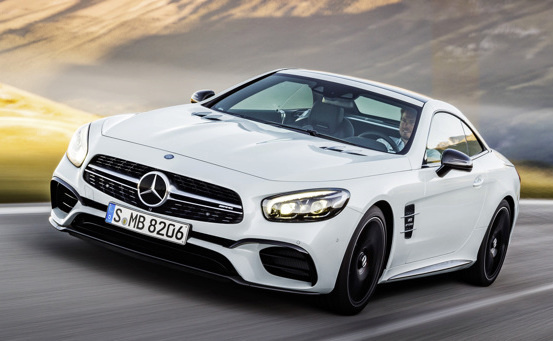 What's your take on the 2017 Mercedes-Benz SL-Class? 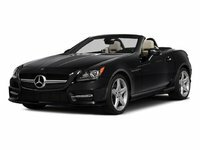 Have you driven a 2017 Mercedes-Benz SL-Class?